Cornerstone Roofing is #1 in WA and #11 in the nation for CertainTeed SureStart PLUS Warranted Jobs - Cornerstone Roofing, Inc. 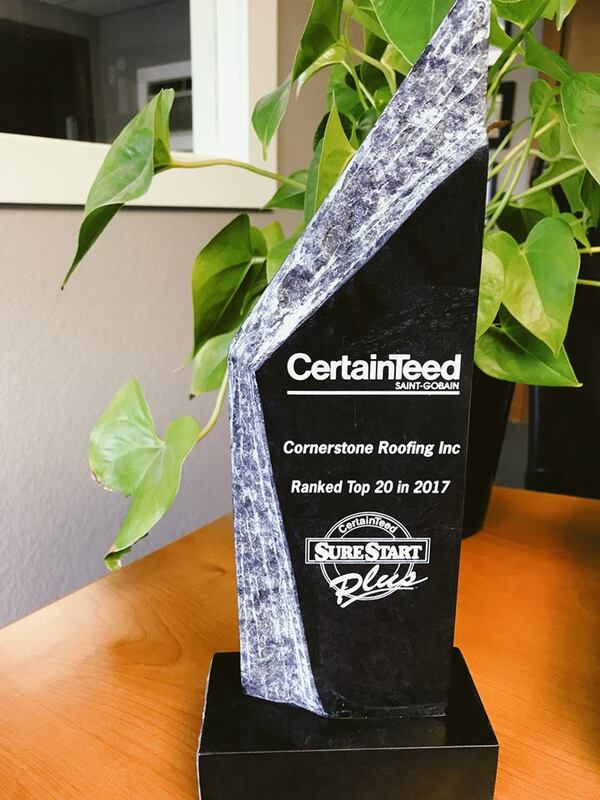 Cornerstone Roofing is excited to have received our CertainTeed Roofing formal commemorative plaque, showcasing being ranked 11th highest in North America and #1 in Washington state for the most CertainTeed SureStart PLUS extended warranty roofing jobs! “Considering the thousands of other eligible contractors you surpassed, that is quite the accomplishment. We appreciate your utilization of the Integrity Roof System™ and SureStart PLUS. Thank you for your support” – Jay Butch, Director of Contractor Programs for CertainTeed. “I am pleased to tell you Cornerstone was #1 in the state of WA and #11 in the country!” – Mark Ivers, CertainTeed Territory Manager. Cornerstone Roofing is happy to be amongst the top twenty companies in the United States that registered the most SureStart PLUS warranty jobs in 2017.